Located close to shopping malls and restaurants. Welcome come back and thank you for your support. We also very much appreciate your comments regarding your stay at the Mercure Kuala Lumpur Shaw Parade. It is always a pleasure to receive positive feedback. I will share your comments with our team. I am sure that this feedback will serve as an encouragement to all of our staff as we strive to continuously improve the quality of our services. Perfect location to explore the Kuala Lumpur city! You can try all kinds of the Malaysian signature foods at the breakfast buffet. The menu seems to change everyday. All the food tasted perfect!! 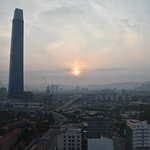 I had an amazing front view of the sunrises out of the big windows in my room on the 15th floor every morning. The hotel staffs were young and friendly. Very nice people with the diligent attitude to work. I'm a little too fussy about cleanliness and the hotel was okay. I would definitely choose this hotel for the next time in Malaysia!!! We very much appreciate your awesome comments regarding your stay at the Mercure Kuala Lumpur Shaw Parade. It is always a pleasure to receive positive feedback, and we were able to meet your expectations also that you enjoyed the breakfast spread prepared by our Chef. I will share your comments with our team. I am sure that this feedback will serve as an encouragement to all of our staff as we strive to continuously improve the quality of our services. I would call it “the best Mercure brand hotel “. So clean and so cosy! Pretty new. Reception looks like a small library. Small bar around the cone with different way to seat. Very nice rooms. You don’t want to go out of it! Very nice place for breakfast. Again so cosy. Nice small pool on the roof. Ok location. 5 min. walk to monorail station and huge shopping mall, if you need it. Only downside is a building site nearby, but you are in a centre of big city, not in a resort. Very happy with all staff. Always friendly, polite, helpful. Big “Thank you” to Norashidah, guest experience executive and administrator. Perfect service. First of all, thank you for your support! We appreciate your positive comments regarding your stay at the Mercure Kuala Lumpur Shaw Parade very much. It is an honor to receive such highly rated ranking of us in your feedback. I will share your comments with our team and especially Ms. Norashidah. I am sure that this feedback will serve as an encouragement to all of our staff as we strive to continuously improve the quality of our services. Will definitely stay at Mercure Shaw Parade KL again! 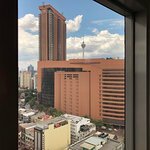 My husband and I stayed at the Mercure Shaw Parade KL for five nights in February 2019, and we really enjoyed our stay there! The room was spacious and had a very comfy bed. The hotel facilities felt new, and were always clean. We loved that the pool was at the top of the hotel, from which we had a view of the sprawling city. The staff were polite, always greeting us with a smile whenever we walked in and out of the hotel. Even the hotel security guard standing outside the lobby was friendly, introducing himself as originally from Nepal, and taking an interest in where we were going. When we requested to borrow a bowl and spoon from the hotel, one of the staff promptly lent them to us. The hotel is situated in a great location too! Although it's not in the heart of the shopping district, it's only a five-minute walk to Berjaya Times Square, and a 15-20 minute walk to the Pavilion/Lot 10/Sungei Wang shopping area. There are also local coffeeshops around the Mercure Shaw Parade area, where we found affordable and delicious food! We had Ah Khoon fishball noodles for around RM8-10 a bowl, and two pratas and two glasses of teh tarik for a total of RM6 at the malay coffeeshop on the right of 7-11, opposite the hotel. The only small issue we experienced was that the hotel room fridge wasn't very cold. 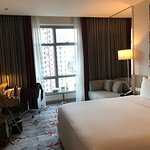 But other than that, Mercure Shaw Parade KL exceeded our expectations, and we'll definitely choose to stay there again should we make another trip to KL! Room tip: We stayed on the 17th floor and the views were great! We very much appreciate your detailed and awesome comments regarding your stay at the Mercure Kuala Lumpur Shaw Parade. Thank you so much again for sharing your experience, and we hope your next visit will be as pleasant as the previous one. I really enjoyed my stay at this hotel- I received a fantastic view of KL from the 17th floor. The rooftop pool and gym was great too. I found it to be a great base to plan my visits to KLs key landmarks. Staff were courteous and responsive to my needs. Breakfast was perfect lots of dishes on offer including double espressos, fruits, yoghurts and juices. The Grab Taxi service was fantastic too not only in KL but also in Penang and Langkawi- I saved lots of money on my transfers. Thank you very much for the awesome comments and ratings you have for Mercure Kuala Lumpur during your recent stay with us. It is really appreciated when we receive feedbacks from our guests, as it is through feedbacks that we are able to continue what we have done right and improve of what we could improve. In this case, my team and I are really pleased to hear that all is good. We look to welcome you back to stay at Mercure Kuala Lumpur Shaw Parade again. I'm never impressed when a property imposes a load of rules on you ("Guests are not allowed to take room towels to the pool") or gleefully emphasises the limitations of its own package you've bought ("You may only choose a main course"). I'm even less impressed when they don't hold up their end of the bargain. Not once during our two night stay did this hotel deliver on promise. The first set of laundry didn't show up, required several chasing phone calls, and then was brought to our door without an apology. The second set of laundry wasn't even done - and again without apology I am sitting waiting for my dirty clothes to be returned. The setup is extremely odd throughout, especially for food. Avoid any kind of quasi half board option - we had one, it was more trouble than it was worth. You have to dine by the pool, which is odd. The food is brought from some other place in the hotel. We were delivered the incorrect dishes, and told that my 2-year-old daughter would have to pay for hers (an arbitrary made up amount), as she was not included in the package - even though our room booking was for three people. Any requests for a mild deviation from the menu (such as not wanting my daughter to only be permitted to eat fast food) were met with incredulity and confusion. This would all be forgivable if the general service experience was positive and slick, but it's neither. Check in literally took 20 minutes (none of this was queuing time), including my being forced to sign an incredibly infantilising form promising not to smoke (!). Payment was very messy with the hotel attempting to insist I pay on a card that they had previously told me they could not process. And a small item of ours was lost by the porters in between the taxi and our room. 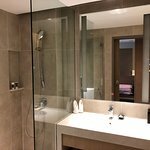 We have previously stayed at the Hilton at KL Sentral, which is frequently available for only a little extra money, and desperately regret not having done so this time. Thank you for taking the time to tell us about your experience at the Mercure Kuala Lumpur Shaw Parade. I am sorry that your experience at check-in and dining did not meet your expectations; please allow me to express my sincerest apologies. At Mercure, we strive to provide a superior service experience for every customer; therefore your feedback is very important to us. Please rest assured that we are taking the appropriate measures and trainings to address the problem and prevent future occurrence. We appreciate your sharing your concerns, and it is our hope that you will give us the opportunity to better serve you in the near future.